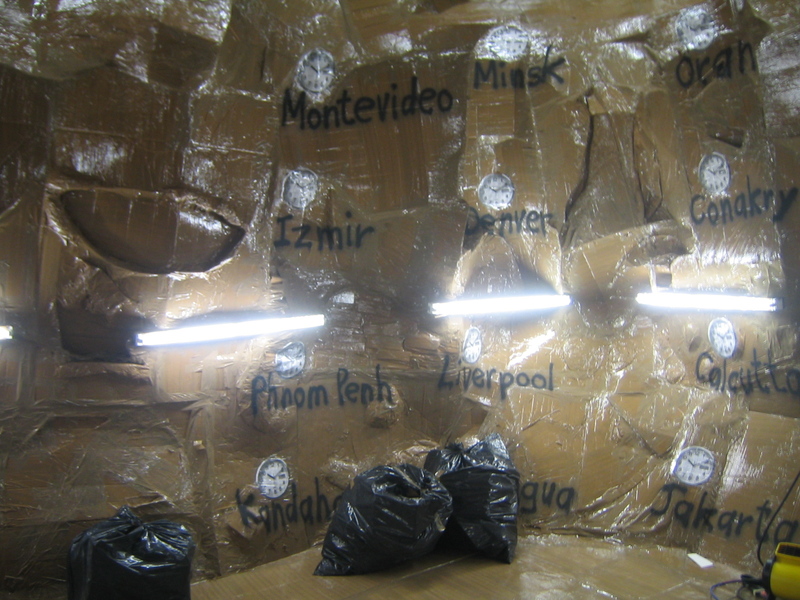 There’s a primal satisfaction in walking into a haughty, high-stakes, white-cube Chelsea gallery to find that you’ve entered a messy, makeshift cave. 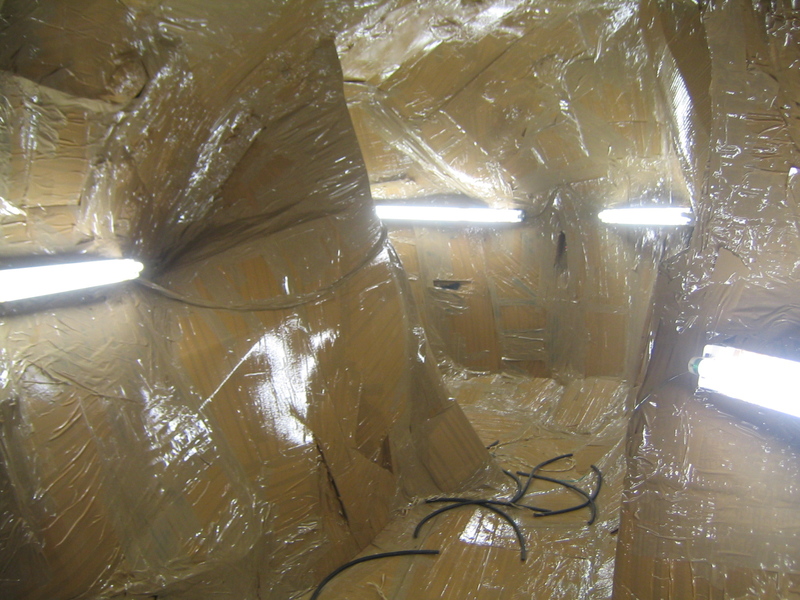 The cavernous labyrinth of lumpy tunnels, nooks and crannies, rocky pathways, and culs-de-sac, all clumsily made of cardboard, aluminum foil, and miles of shiny mud-brown wrapping tape, is preposterous, slapdash, sort of womb-like, and vaguely intestinal. Its bumpy ground is littered with very fake rocks. Cans of Sprite and Coca-Cola litter the floor and overflow from gold foil garbage cans. Xeroxed pages from books about justice and democracy are taped to the walls. And in addition to us transient viewers, stumbling along its paths disoriented and bemused, the five-room cave is inhabited by clusters of aluminum foil figures and foil-wrapped shopwindow mannequins, who are linked by foil cords to make-believe explosives or books. Hostages or terrorists, throwbacks to the past or refugees from the future, these figures also evoke, quite by chance, the recent episode in a Moscow theater, but Cavemanman was in the works long before that site of cultural production was overtaken or stormed. The slogan scrawled repeatedly on the cave’s walls, “1 man = 1 man,” has to do not with terror but with absolute equality. Hear Hirschhorn speak at a free gallery talk tonight, and while you’re here don’t miss our other cave, a winding hilly path only wide enough for one lantern-bearing visitor to navigate at a time, installed in the exhibition Cameron Jamie (closing October 22).